Burberry can not believe their luck, as they’ve just managed to sign a contract with West Ham. Burberry were lucky to outstrip other luxury brands, having offered the club the most favorable terms. Now Burberry is going to launch a collection with the famous West Ham hammers. “Do not disappoint us,” the West Ham representative says. Do you want to know what is going on? You’ll find the answer below! It’s the fourth issue of #AlienForEPL, in which I, Leon The Alien, develop cool marketing strategies for clubs on the basis of sports neuromarketing. I’ve already involved Middlesbrough, Chelsea, West Bromwich under this heading. In addition, you can read about other imaginative strategies under the #AlienForMLS heading. Regular readers of my blog on sports neuromarketing are already aware that our brain provides us with a large number of opportunities for unusual and effective interaction. Before we can outline the strategy for West Ham, we have to understand the theoretical part. We are going to discuss the effect of seemingly unrelated circumstances on our decisions. Many are aware of a number of strange correlations, like the impact of pirates on global warming or other equally remarkable coincidences. Our brain is trying to establish some patterns wherever it can to be able to simplify and remember the individual points to further reproduce the memory with. Yes, our brain does not fix the event in memory completely. It fixes only the basic elements. And every time we recollect something, we have new details surfacing in the memory, which in reality were not there. This is an excellent opportunity to preserve the resources of our brain, but there is a problem. Our civilization has developed, our knowledge has developed, and even the society has progressed a little. But evolution goes another way. Today we are going to consider a peculiar study by Mathias Pessiglione and his colleagues on the interconnection people unconsciously establish between different events. During the experiment, participants had to make a 50/50 choice (tossing of coins). Before making a choice, the participants were demonstrated the noise with various abstract symbols switched on for a period of 33-50 ms. Each of these symbols corresponded to either a positive or a negative result, or did not affect the result at all. The participants of the experiment could not consciously distinguish these symbols, but were told that there was a symbol among the noise that indicated the result. It turned out that subconsciously participants established the interconnection between the symbols and the result. And when it happened, people were prone to risk when the noise involved a symbol corresponding to a positive result. When asked why they made a risky choice, the participants responded that it was an accidental decision. That is, consciously it was an accidental decision, but subconsciously there was a Q-learning process going on. When scanning the brain with fMRI, the researchers discovered the activation of the ventral striatum, which included the nucleus accumbens. What does all this mean? This is another demonstration of the fact that most of our decisions are taken unconsciously. Even when it comes to decisions that we think we are taking consciously. I would also like to point out the connection of the results of this study with the anchoring effect, in which random numbers affect the response. Only in the case of anchoring effect, information that serves as an “anchor” is consciously perceived. I’ve covered the anchoring effect in more detail here. How can we use it? The most obvious application is in gambling, including Forex. As far as I know, the gambling industry uses similar mechanisms, but with a different approach. It is in sports that the results of this study can also be used. I suggest this strategy to be applied by West Ham. West Ham is an excellent club with an awesome brand. They’ve got their own outstanding symbol of hammers. In my subjective opinion, it’s one of the most striking symbols among the Premier League teams. And it’s the symbol to make a lot of money on. In what way? Use the priming of luck to work for the brand. If you are looking for an opportunity to position your brand in a new way, making it “lucky” is a brilliant option. The above study is one of the keys to developing a quality strategy in this direction. I suggest making the “West Ham” hammers the analogue of the clover. In the long term, such positioning is going to give the club an opportunity to earn a lot. And I’m not just talking about cooperation with the gambling industry. It’s not the best option for the brand. I mean collaboration with brands in various fields. Many will be willing to use the West Ham brand as a symbol of luck. What does West Ham need for this? First, you need to associate the West Ham brand with luck. Since the club’s sport results don’t allow to directly declare the successfulness of it, you’ve got to talk about luck carefully. You should avoid direct association with sports results. You can position luck as a lifestyle of West Ham. 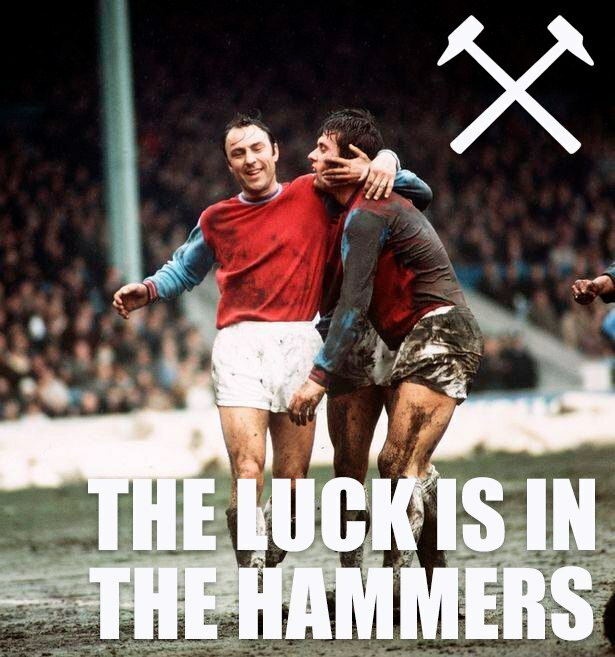 For example, “The luck is in the hammers” can be the motto of the club. Then you’ve got to identify the symbols of luck for different segments of the target audience. It could be a clover or “777”. Your next task is to present these symbols in conjunction with the West Ham brand in such a way that they could not be detected consciously. However, unconsciously our brain constantly monitors the surrounding space (the bottom-up attention), so the message we need will reach the brain directly without being blocked by the consciousness. Neuromarketers constantly apply this principle in different approaches to the creating of advertising. How do we organize it? You can come up with a whole lot of ways. Say, it can be groups of fans in the stands dressed in T-shirts of slightly different color tones than that of the West Ham jerseys. These fans will form the symbols we need. You only have to make sure that the brain will not recognize these symbols consciously. Then you can see to it that West Ham fans become winners of some TV shows (at least, it is easier to achieve than to become a champion of the Premier League). They can either remind of their sympathy for West Ham, or be dressed in a club T-shirt. Think of Katy Perry. For me it is Katy Perry in the form of “West Ham” who is the first association with the club being mentioned. As a result, you can measure the effectiveness of the campaign using the tools of neuromarketing. And then you are on the wave of monetizing “luck”. If you enjoy my blog, subscribe to me on Twitter! And do not forget about our weekly E-mail newsletter. This way you’ll never miss my new articles from the world of sports neuromarketing. Do you want to get a consultation, a detailed strategy or an implementation of it in your football club (and beyond)? Then write on E-mail leon@sportsneuromarketing.com! And we will contact you within 24 hours.